I've been a member of this group for a few years, but today I left it, after becoming exasperated with fruitless, circular arguments with liberal Catholic social justice warriors. When I initially joined the group, I'd hoped it would be a forum for exploring various aspects of Catholic social teaching, either in exploring teachings from the great encyclicals of Leo XIII, Pius XI and Pius XII, or discussing contemporary social problems in light of Catholic Tradition. Unfortunately, this page was by and large a cesspool of progressive nonsense. I will explain briefly what I mean by this, but I want to preface by saying that it is amazing how Catholics can think "Catholic social teaching" can mean such radically different things. There seems to be multiple different strands of Catholic Social Teaching existing side by side, each claiming the same authority. It's very confusing. At any rate, the stuff I encountered on this Facebook page was very much in the liberal-progressive bent. Here are some common traits of this strain of Catholic Social Teaching I gleaned from my few years interacting with these people. Papal documents were cited profusely, but mainly documents of Paul VI, John Paul II, and Francis. I don't think I ever saw anything from Leo XIII cited, even when the people on the page were discussing matters relating to wages, labor, etc. Certainly no mention of Pius XI and Quas Primas and Christ's social kingship. I am presuming my readers know what the "consistent ethic of life" position is, also known as the "seamless garment" argument. It essentially is a liberal talking point that says if you oppose abortion, you must also oppose the death penalty, war, and just about every situation where violence may be used. This "consistent ethic of life" idea was exaggerated to the point where every liberal talking point became a "pro-Life" issue, with the implication that one was not "really" pro-Life unless one supported the global climate change agenda, abolition of the death penalty, socialized health care, liberal spending programs, and everything else. Thus the "consistent ethic of life" became equivalent to the political program of liberalism by expanding to a ridiculous level. I don't think I saw any articles against abortion - or if I did they were few and far between. But I did see a constant barrage of articles attacking Pro-Lifers. Essentially these critiques followed in along the lines laid out by Pope Francis of telling Catholics not to "obsess" over the abortion issue, as well as suggesting that Pro-Life Catholics were not "really" Pro-Life because they didn't do enough to promote social programs to help mothers and children - which is a point I deny, but that;s beside the point. This really ties in to the next issue on the false equivalence between Catholic Social Teaching and liberalism. Conversely, pro-Choice politicians such as Hillary Clinton are given a pass because of their liberal credentials. This is actually something that is common to liberal thinking in general. Essentially, a social problem is identified. Liberals propose a solution solve to the problem. Then the equate their particular solution with the only solution, implying that only they really care about solving whatever problem they are discussing. Example: There are many unwed mothers struggling to raise their children in poverty. Nobody disagrees with this. The liberals put forward a characteristically liberal solution - taxpayer subsidized, government programs! Now, it must be admitted that this is only one proposed solution to the problem. There could be others. Reasonable people who all agree that poor single mothers need help can disagree on the most effective solution to the problem. Liberals, however, will go on to act as if their solution is the only solution, and those who do not support taxpayer funded government programs for low income mothers are attacked as not "really" caring about the issue. This is classic liberal false equivalence, and this manner of thinking is endemic among Catholic social justice warriors. Sources of authority are inverted. For example, on the question of capital punishment, very low level documents by John Paul II and homilies by Pope Francis are given absolute authority, while authoritative statements like the Catechism of Trent are poo-pooed. Sources of dogmatic authority are inverted, with non-authoritative ones being given absolute authority and authoritative ones treated as dispensable. Obviously this implies a very sharp split with the way pre and post-Conciliar sources are treated. Essentially, working for Catholic Social Teaching is equated with the progressive "social justice" warrior. One gets the impression that these people really think secular-liberal "social justice" is the same thing as Catholic Social Teaching. I do not want to believe it is only because both concepts have the word "social" in them, but I am starting to think that is really it. Essentially, there is no modicum of independent Catholic social action that is formed within an authentic Catholic framework. When considering social action, it is like they can't conceive of a social action that is fundamentally distinct from liberal activism. Of course, this can happen with "conservative" Catholics as well, who can tend to make Catholic social teaching equivalent with free market economics and a neo-con political program. But of course, the answer is not a pivot to the Left, but rather to escape the spectrum entirely with an authentic, independently Catholic social vision that is prior to and bigger than the stupid Left-Right spectrum of American politics. What we have on the Catholic Social Thought Facebook page is essentially some of the worst statements at the lowest level of dogmatic authority interpreted through a lens of liberalism. It is truly amazing that people can have such huge divergent opinions of what constitutes Catholic Social Teaching, but such is the Catholic world we live in. On June 7th, the Holy Father Pope Francis delivered a catechesis on the Our Father during his General Audience. The center of his message was that far from being a God distant and unconcerned with man, God is intimately close to man and cares deeply about his affairs. He longs for man's salvation with divine paternity; this is why Christians call God "Father", and the pope called us to reflect on what a revolutionary concept it is to understand God as a Father. Protestants and certain Catholics alike have come out with accusations of heresy or blasphemy against the pope on account of these statements. The accusation is that Pope Francis is teaching that God some how requires man - that the divine substance stands in need of humanity in order for it to be complete, for God to be God. If this were true, this would make God's omnipotence dependent upon man, the Creator dependent upon the creature, and entirely invert the relationship between God and man. Such would be a very problematic position indeed! I have been critical of Francis' speech in the past, both in his manner and content; I even wrote an ebook chronicling a series of theological concerns arising from his encyclical Laudato Si. 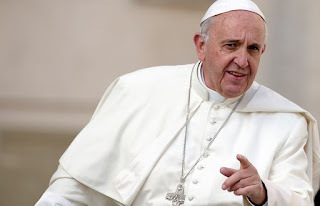 I am certainly no papolater; I'm not one of those people who feels the necessity to offer a knee-jerk defense of every word that comes out of the pope's mouth, least of all in a very low-level, non-biding, non-authoritative pronouncement like a General Audience. That being said, I do not think what Francis said here was blasphemous or heretical. Sloppy? Yes. Poorly worded? Definitely. Heresy? I don't think so. First, we must remember that there are two ways to consider God. We may speak of the "theological Trinity" (sometimes called the "immanent Trinity") or the "economic Trinity." When we speak of the theological Trinity, we are speaking in terms of what God is in and of Himself without reference to His creation - to the mysterious inner life of God Himself. When we speak about the economic Trinity, we are speaking about God with reference to the economy of creation - God in relation to creation. The theological Trinity speaks of who God is, the economic Trinity what God does in relation to the world. When we are speaking about the salvation of the human race, we are speaking of the economic Trinity. Understood in and of Himself, God does not "need" man or anything other than Himself. He is perfectly self-sufficient and blessed in His own nature. He is all-powerful and all-knowing and needs nothing whatsoever. As Acts 17:25 says, God stands in need of nothing. Creation needs Him; He does not need creation. God is perfectly self-sufficient. But God did not remain solitary. He freely created mankind, and in creating man out of love, He bound Himself to the fate of man, in the sense that He continues to seek man and provide for man's welfare, even when man rejects Him. From beginning to end, God is initiator of man's salvation. He is the one who calls man to communion, who sent His Son to die, and who constantly prepares man's heart to receive Him via grace. God is the initiator of man's salvation in every sense. Thus, though God does not "need" man in an absolute sense, within the economy of salvation He cannot stop seeking man. God is faithful and has promised to provide for man's redemption. He cannot fail to seek man anymore than He could lie or betray His word. Through an utterly free decision, God has revealed himself and given himself to man. This he does by revealing the mystery, his plan of loving goodness, formed from all eternity in Christ, for the benefit of all men. God has fully revealed this plan by sending us his beloved Son, our Lord Jesus Christ, and the Holy Spirit (CCC 50). Francis says the Gospel of Christ reveals that God cannot stay without us. Though God communicated to man in many ways throughout salvation history, His definitive revelation to man comes through Jesus Christ. "In many and various ways God spoke of old to our fathers by the prophets, but in these last days he has spoken to us by a Son" (Heb. 1:1-2). The people of the Old Testament knew that God was loving, but the depth of His great love are revealed by the mission of the Son and His atoning death on the cross. This love is perfected in the Incarnation and Crucifixion. God does not need man, but at the Incarnation He forever united Himself to human nature in Mary's womb. The Incarnation is the permanent union of the divine nature with human nature. Thus, since the Incarnation, Francis is right to say God will never be a God without man. Christ will never not be a God-Man. The Incarnation permanently bonds God to human nature and forever orients all God's saving acts in the world towards mankind. In the economy of salvation, the acts of God are always ordered towards man's beatitude. "God cannot stay without us", yes, in the sense that God can no more abandon mankind than He can undo the Incarnation. The Incarnation was a total and irrevocable commitment of God to mankind. Again, the Catechism says, "Although man can forget God or reject him, He never ceases to call every man to seek him" (CCC 30). Is it then true that "God cannot be God without man"? Not if we take this to refer absolutely, to the theological Trinity; of course, the divine nature needs nothing to be complete. But the whole focus of the pope's homily was God inasmuch as He is a Father to His people; in other words, the economic Trinity, God within the economy of human salvation. And within the economy of salvation, God has permanently and irrevocably committed Himself to the calling, redemption, and glorification of mankind. As long as creation endures, God cannot un-orient Himself from mankind. For God to be what He claims to be, He cannot be without man. He cannot abandon man. He has promised He would not. "Lo, I am with you always, even unto the end of the age" (Matt. 28:20). Thus, I think those who find Francis' words here heretical are not sufficiently grasping the concept of God's permanent orientation towards man within the economy of salvation. Some are citing verses like Daniel 4:35 and Acts 17:24-25 as evidence that Francis has taught heresy. The passage from Daniel merely notes that God is all-powerful and can exercise His will unhindered; the passage from Acts 17 states that God does not need anything. Neither of these undermine the pope's words; if God is all-powerful, as Daniel teaches, then He can voluntarily bind Himself to His creation through all His salvific acts, especially the Incarnation; and since God does not need anything according to His divine nature, as Acts 17 teaches, then the fact that God is so faithful in His relentless pursuit of man is even more marvelous. God does "need" to do certain things that He has voluntarily bound Himself to. It's like asking does God " need" to forgive the original sin of a person coming to baptism under the right conditions? Considered absolutely, no, but considered in terms of God's salvific works, in terms of what He Himself promised to accomplish through baptism, then yes, God does "need" to remit original sin through baptism - otherwise we would have no confidence in the efficacy of the sacraments. But it must be stressed that this "necessity" is not any kind of compulsion that moves God from without, but rather it flows from God's faithfulness to His own promises. The only thing that binds God is His own word. Could Francis have worded this better? Could he have perhaps been more sensitive to how his statements could be taken? Could he have perhaps offered more precise distinctions. Would such a clumsy theological statement probably have been censored a hundred years ago? Affirmative on all counts. But I don't think there is anything inherently heretical in these statements, understood rightly. His words are sloppy and confusing, per the norm, but in this case there is nothing to cry afoul of.